View of “Diamond Stingily,” 2016. Five unhinged doors, standing upright in space, look more like shields than portals. Each one is titled Entryways (all works 2016). A baseball bat leans on every one of the uniquely worn, deadbolt-adorned rectangles stationed around the dim gallery, evoking the violence and vigilance of everyday life. While these unfriendly readymade and pre-owned doors are the most immediately commanding element of Diamond Stingily’s show, a looping video is the centerpiece. 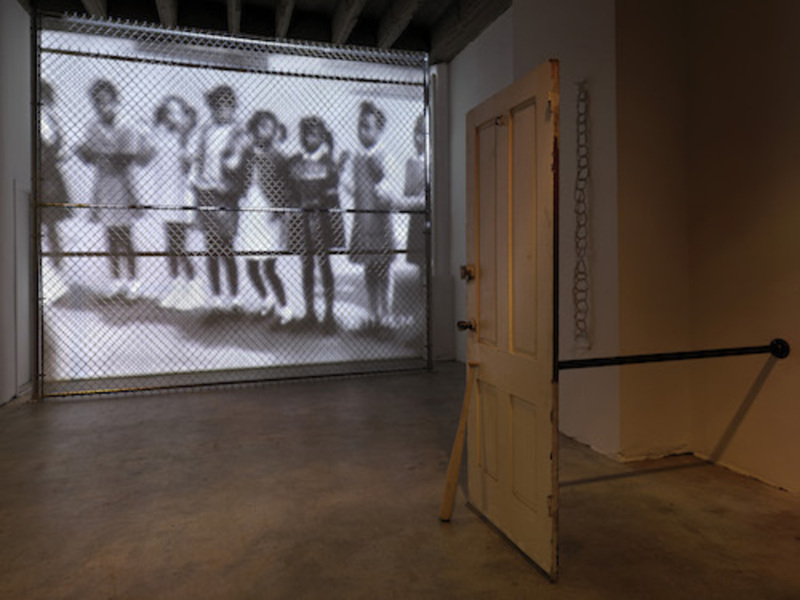 Facing the entrance, on the far wall, is a large projection of vintage black-and-white footage—taken from folklorist Bess Lomax Hawes’s short 1967 documentary Pizza Pizza Daddy-O—that shows African American girls playing in a schoolyard. A chain link fence, installed just in front of the wall, casts its ubiquitous, carceral lattice shadow on the scene. Though the girls appear to be safe and mostly having fun as they run through their repertoire of playground songs, Stingily teases out a haunting refrain. The video’s title, How Did He Die, is taken from a strangely morbid call-and-response chant the girls perform. The woven construction of the fence echoes in other elements, such as the looping telephone cords that form the artist’s simple, poetic Double Dutch Rope sculptures, as well as in the hardware and braids of Elephant Memory. The latter work, which looks like an airy tapestry from afar, is composed of pairs of long steel chains, each cold stripe hanging from a metal hook. The lengths are accessorized with various colors of plaited synthetic hair—black, gray, brown, auburn, blond—that end in frayed, brushy bursts. One thinks of jewelry as well as shackles. A complicated nostalgia colors Stingily’s powerfully restrained and formally smart show. An Arte Povera artist for our time, she reflects on the normalization and replication of brutal scripts and systems using perfect, pervasive materials.